DON’T JUST DIAGNOSE YOUR ELECTRICAL PROBLEMS, FIX THEM YOURSELF WITH THE BONUS SOLDERING IRON, STAND AND WIRES. A ONE YEAR WARRANTY IS ALSO PROVIDED: with every purchase we’re including a 30W, 500° maximum soldering iron, soldering iron stand, solder wire and 2 alligator-clip leads. 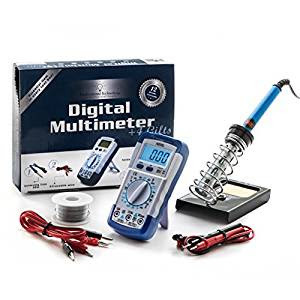 Buy without worry; at Professional-Technology we stand by our products’ quality craftsmanship by offering you a one year warranty on the Digital Mulitmeter kit.